Hello everybody, my name is Polly and I am 18 years old. 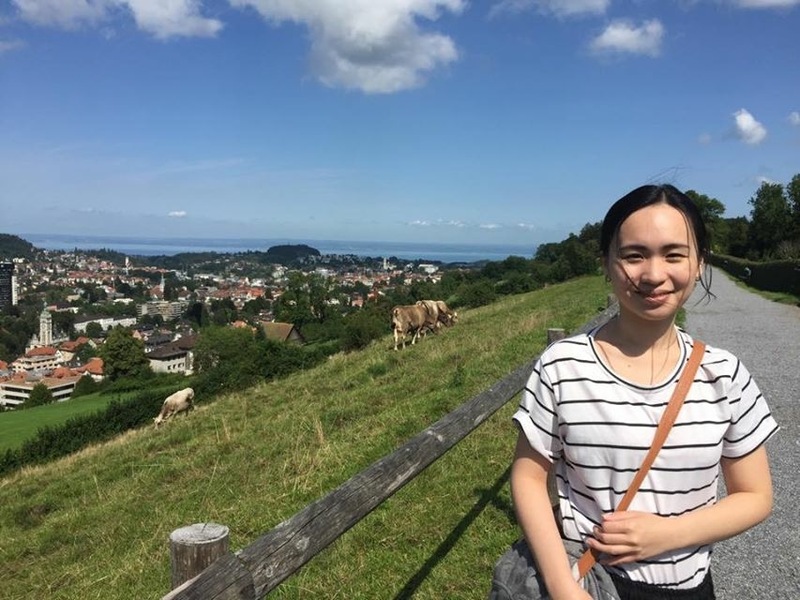 I come from Taiwan and I am doing an exchange year at a high school in Switzerland. What is fascinating me the most in Switzerland? Well, for me the fresh and clean air in Switzerland is exciting. One weekend I decided to do an excursion to the oldest city of Switzerland, Chur. I have chosen to stay in a small and cosy hotel in the city centre where a brochure with the slogan “By 2050 not only the land is green in Chur, also the hotels in Chur will be valued for their sustainable bathrooms” at the reception desk of the hotel took my attention. 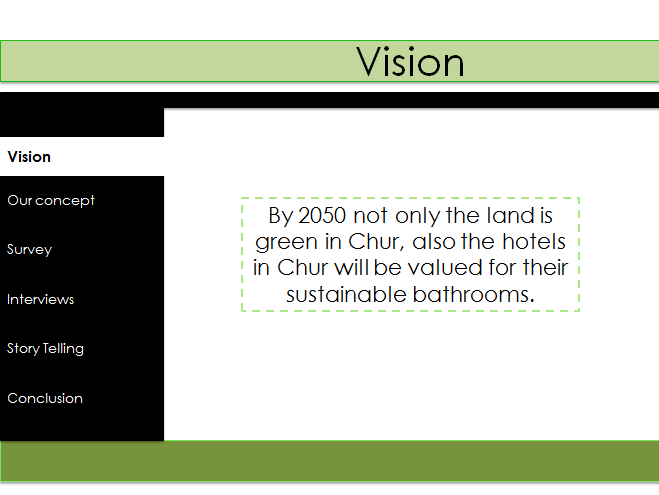 The brochure contained an article about the Green Hotels concept which should be implemented in all the hotels located in Chur by year 2050. Since sustainability is getting more popular and because I feel good when I contribute to a better environment, I like the idea of hotels engaging to the environment as well. I was overwhelmed by the idea of the project managers and I can see it in front of my eyes. You can see my thoughts about this vision here. A few weeks later, I got the task to hold a presentation about a Swiss topic at school. 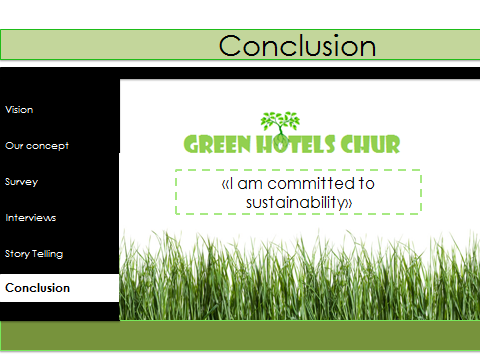 Since the Green Hotels concept convinced me, I considered this project to be a suitable topic for my presentation. As the importance on how to contribute to sustainability on a personal level is increasingly important, I am curious to learn more about this issue and therefore I want to share my gained knowledge with you! Out of this background I composed this blog for you, beloved readers, to bring this project closer to you. I therefore invite you to dive with me into this interesting issue. Hi guys, another day passed and I started to prepare my presentation. 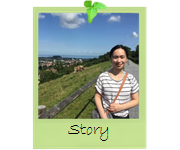 To structure my blog I will continuously inform you about my status of my project in form of a diary. I hope you enjoy reading my thoughts and that the collected info’s increase your personal awareness of sustainability. Let’s get it started with my research of the Green Hotels concept. 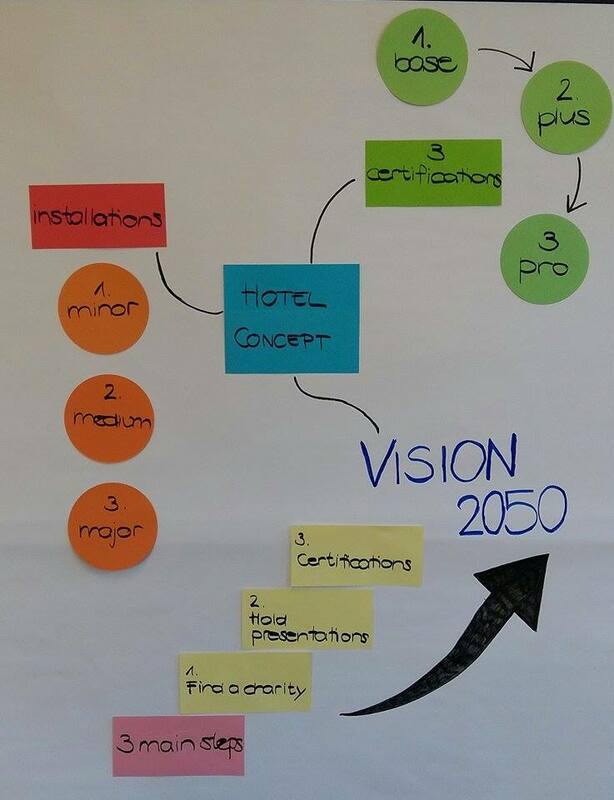 To visualize my actual knowledge about the hotel concept, I created a small mind map for you. Major installations are the most expensive and belong at the same time to the highest standard of possible sustainable installations. In order to motivate the hotels to participate in this concept, the hotels are rewarded with certain certificates as soon as they implement a concrete number of installations out of the three above mentioned categories. 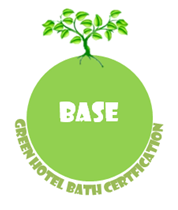 To be awarded with a Base certificate, the hotel must implement all minor, 2 medium and 1 major installation. 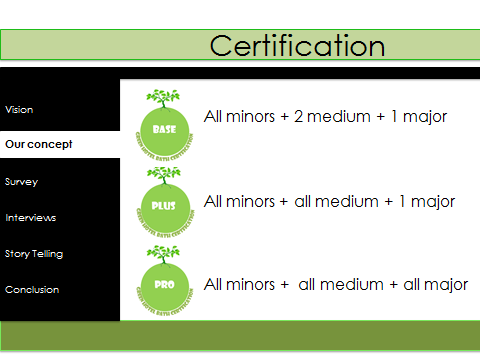 A Plus certificate includes all minor, all medium and 1 major installation. 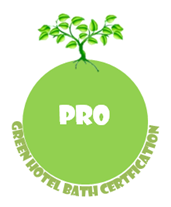 Hotels that are especially sustainable are awarded with the third and most recognized certificate, the Pro label. 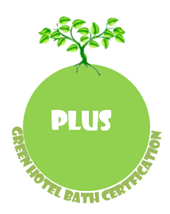 This gradation should motivate the participating hotels to strive to a higher level of certification, which enhances the reputation and national recognition. Of course, such a concept needs a strategy behind to promote the project in order to gain awareness. 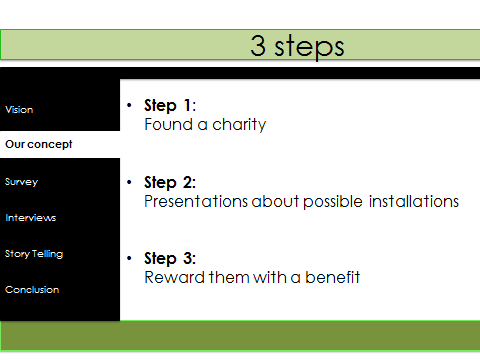 The following three steps have to be carried out to reach the unique vision by 2050. Uff, time flies. It’s already five to eight in the evening and I am still at school. Now it is time for me to go home. Thanks for your patience. To get enough background information, I gathered all the information I could find about the Green Hotels project. Even if theory is dry, I suggest you to read it carefully since it contains a lot of valuable information for a sustainable living. Furthermore I draw the sustainability model to show all the different aspects. You find all the theory part here. Hey there, some time has passed and I had to gather useful information of the sustainable and energy-efficient installations of the hotels included in this project. I found some interesting facts of conventional installations and in comparison with sustainable ones. So, enjoy reading and remember the facts for your personal life, they are crucial! Did you know: With a 10 minutes shower and a traditional shower head you consume more water than with a bath! This means you use 200 to 250 litres of water and more than 1 litre heating oil to heat the water you consume! With the usage of a low-flow shower head you need for a 10 minutes shower less than for a half full bath, you can see that the advantage of the former mentioned is enormous. They typically use about 25-80 % less energy than traditional incandescents, what can make you save great amounts of money. Energy-efficient lightbulbs last 3-25 times longer compared to traditional incandescents. For any of you, dear readers, who is looking for a safe and energy-efficient blow dryer, check out the BarBar Eco-800. The main benefit of this dryer is that the time it takes to dry your hair can be cut in half while cutting down on energy consumption. The ECO-8000 saves energy by only using 1000 watts compared to other blow dryers that use 1800 watts to do the same thing. The other benefit of using the BarBar ECO-8000 is its extremely low radiation levels compared to other hair dryers. You may not realize it but hair dryers emit 200-400 mG of harmful EMF radiation, which is more than the amount a microwave emits. The BarBar ECO 8000 only emits 1.9 mG because it doesn’t use a metal coil. Instead, it uses a ceramic block that is much safer and performs better. The future hotels in Chur make no distinction between waste and supply. 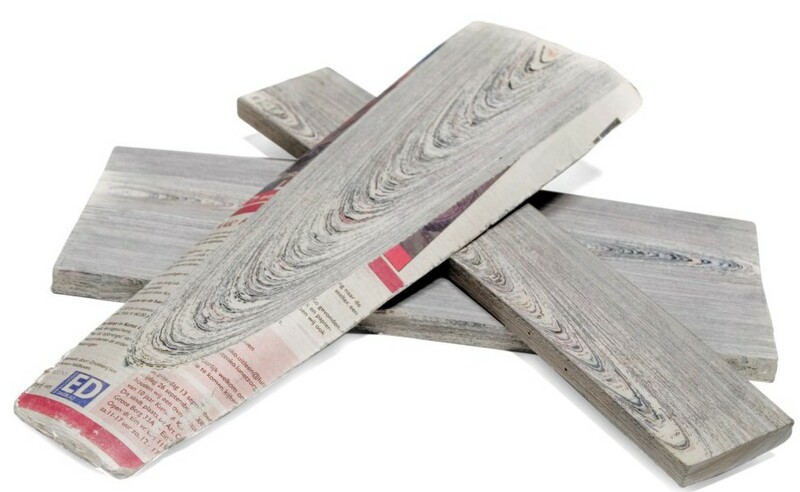 To be sustainable, the hotel chains make use of so called newspaper wood. This design comes from Norway, where 1 million tonnes of paper and cardboard are recycled every year. The wood is created by rolling up paper and solvent-free glue to create something not dissimilar to a log, then chopping it into usable planks. It is then sealed so it is waterproof and therefore appropriate for the interior equipment of the hotel bathrooms. Moreover, it is flame-retardant and can be used to build anything you would normally build with wood. A typical bike generator can produce 100 watts. If you pedal for an hour a day, 30 days a month, that is 3000 watt-hours (30 x 100), or 3 kWh. That is less than 1% of what a typical family uses in a month (920 kWH). So if you generate 0.3% of your energy, you continue to get 99.7% from the grid. Not to be forgotten, this amount of self-generated energy will be multiplied by the hotel guests when they visit the gym for cycling. Water is a precious resource and millions of people do not have access to clean drinking water and around 4000 people die from water contaminated illnesses every year. Nevertheless we continue to be wasteful with our resources. Therefore it is crucial that people learn how to preserve water. The Green Hotels counteract this wastage with sensor-controlled taps, since they can significantly reduce water consumption: The return on investment for sensor devices is around 30 percent and the payback period about 3-6 months. And now hold on tight, with a sensor controlled tap you save up to 70% water in comparison with an original one! Another way to preserve water is the reduced washing cycle for towels in the bathroom. In order to do so, the hotels participating in this project only wash the towels if the guests require. This procedure is very effective since washing laundry is a significant use of water, accounting for 15% to 40% of the overall water consumption inside the typical household of four persons. The average personal treated drinking water usage is 150 litres a day. Rainwater could be used for nearly half of this, for a typical household as mentioned above, this equates to savings of 275 litres a day or 100 cu.m. a year! In commercial premises, such as hotels and schools, around 80% of mains treated water is used to flush toilets. The roof of a typical four bed family home captures more than 100’000 litres of rainwater a year. Many commercial premises have much greater roof areas so rainwater capture can be much greater. As you can see, it makes perfectly sense to install rain water flush toilets in order to decrease water consumption. The consumption of non-renewable sources like oil, gas and coal is increasing worldwide at an alarming rate. The time has finally come to look after some other renewable sources of energy such as solar. Moreover, sun is the most important source of energy for life forms and solar energy technologies use the sun’s energy to light homes, produce hot water, heat homes and electricity. Therefore solar panels are energy-efficient installations to produce hot water in the bathrooms. The main benefit of solar energy is that is does not produce any pollution and harmful environmental effects and it is one of the cleanest source of energy at all, it is easy to install and requires low maintenance. As you can see, such sustainable installations bring along many benefits for the water and energy consumption for any household or commercial premises. My next step to prepare my presentation is to bring in some more information out of praxis and therefore I plan to hold some interviews with locals to stress out their point of view of the hotel concept. What made me especially happy is the fact that 95% of all the participants indicated that sustainability is important to them, that is a very impressive figure! Moreover, over 90% say that they also contribute to sustainability, mainly because they recycle PET, separate the waste and try whenever possible to commute by public transport. More than the half has never made experience with sustainable hotels before. But around 34% did. This is because the guests visited hotels that did only wash the towels if from the guests required and in general, avoided to wash them daily. Please remember that I did the survey with locals, that is the reason why the survey is composed in German. And finally, the respondents see the advantages for the municipality Chur behind this concept. 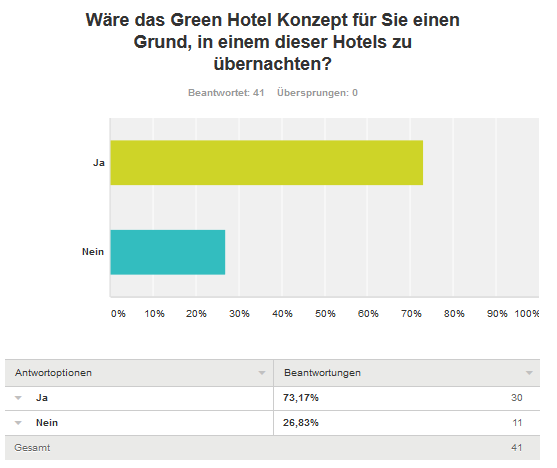 Again, this is a very gratifying answer since it shows that the locals would be willing to support the Green Hotels. To sum up, I got a lot of interesting and varying answers and I am very happy with the result. The Green Hotels concept definitely has a future in Chur, that’s perfect! In 1 hour my presentation is going to be over and this is now my last record in this blog. I want to thank you a lot for your participation and fingers crossed for a good mark! I hope you follow my guideline: I am committed to sustainability and take the findings to heart!